Nostalgia washed over me as I drove into Los Osos at sunset. I pulled into my friend Nikki’s driveway; it was my first visit to her new home. “I can’t believe I haven’t seen you since the Burn,” she said, giving me a hug. “It’s been too long!” I agreed. She hopped with excitement. “Come see my new place,” she walked me down a stone path. Succulents, feathers, and skulls decorated her entryway. “This is my room,” she said as she walked through the door. Nikki showed me the rest of her house — pointing out the craft-style ceilings — and then walked to the large backyard with a view of the Pacific. We made tea and walked back into her room. “I love this quirky town,” I said. “Have you tried it?” I asked. We woke up early the next morning to a sunny and warm fall day. 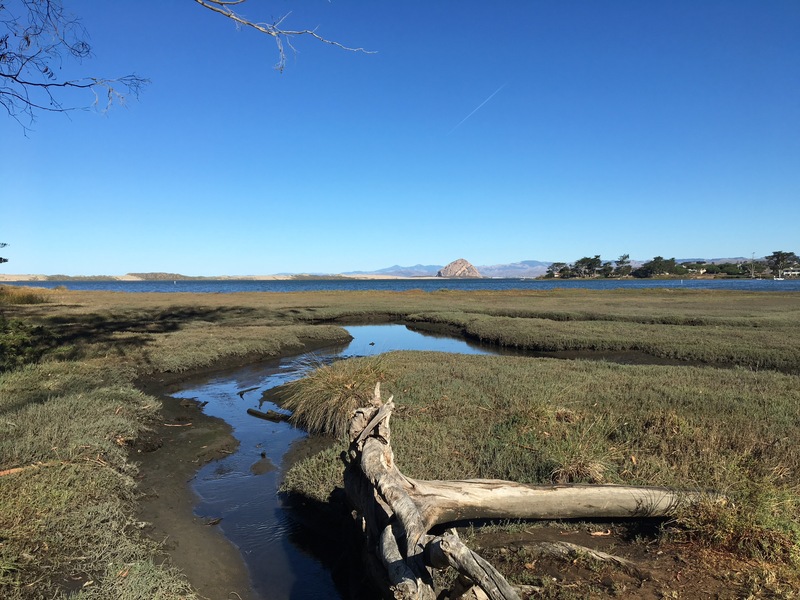 After Nikki and I practiced yoga in her backyard, she went to school and I headed straight to Sweet Springs Nature Preserve, a 24 acre parcel of land neighboring the Morro Bay estuary. Wind rustled through Eucalyptus leaves, producing an airy music and a pungent, menthol scent. 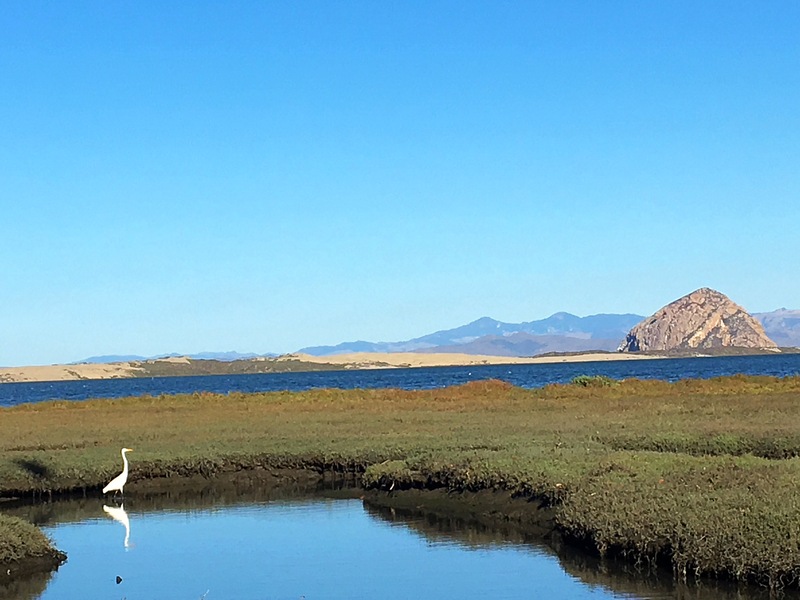 Dirt paths and wooden bridges guided my feet to views of Morro Rock, the enormous volcanic plug considered sacred by the Chumash tribespeople. 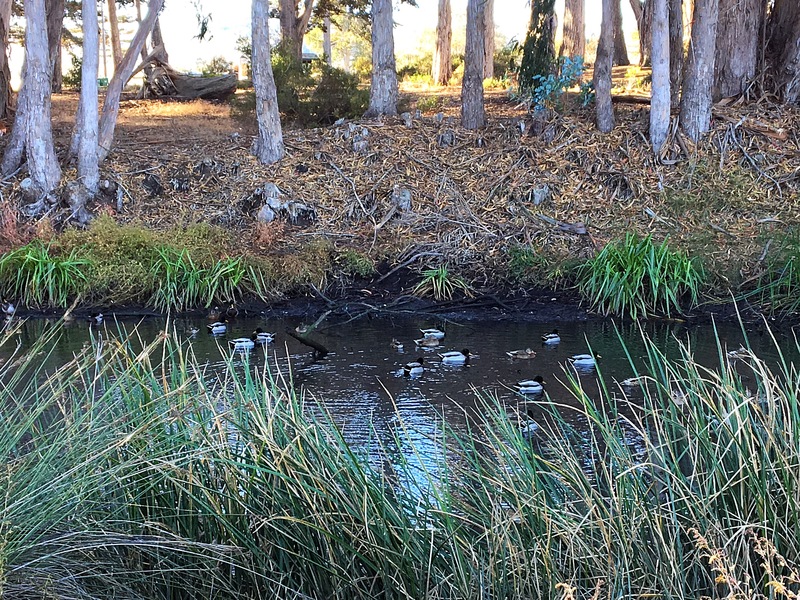 Crossing one bridge, I came upon a flock of mallard ducks quacking and bathing. Several benches dotted the one mile trail, but I sat on a fallen tree at the edge of the marshlands. 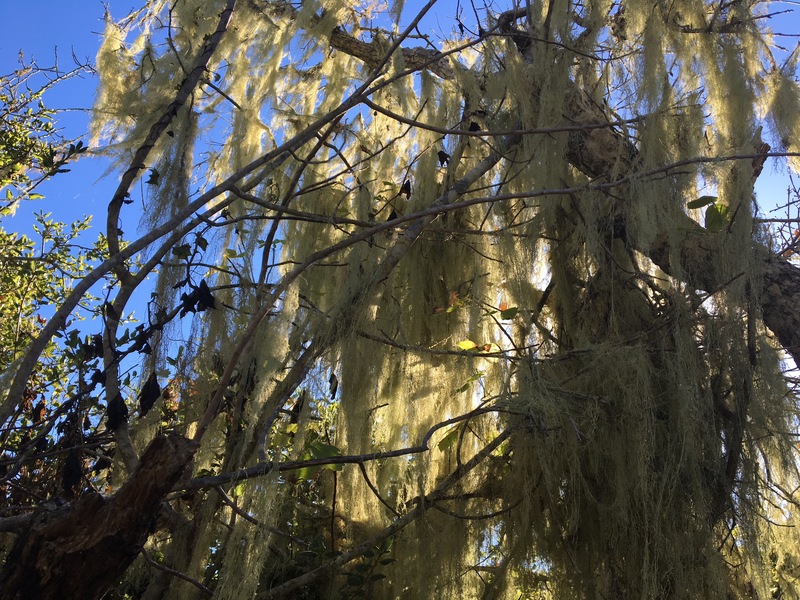 Listening to the Eucalyptus leaves and singing birds, I wondered how I could bring ceremony and ritual into my life to move past my creative blocks. I saw a Blue Heron gliding on the air. A few moments later, a Snowy Egret came into view, stepping carefully through the estuary, catching its breakfast with quick stabs of its long beak. To the west, a large, waning moon hung over the ocean. I walked towards it along a boardwalk. Soft waves coming in from the harbor joined the trees and birds in Nature’s song. A sandpiper walked along the water’s edge, poking its beak in the sand; in the distance, a Blue Heron stood in tall grasses and a Snowy Egret perched on a docking post. 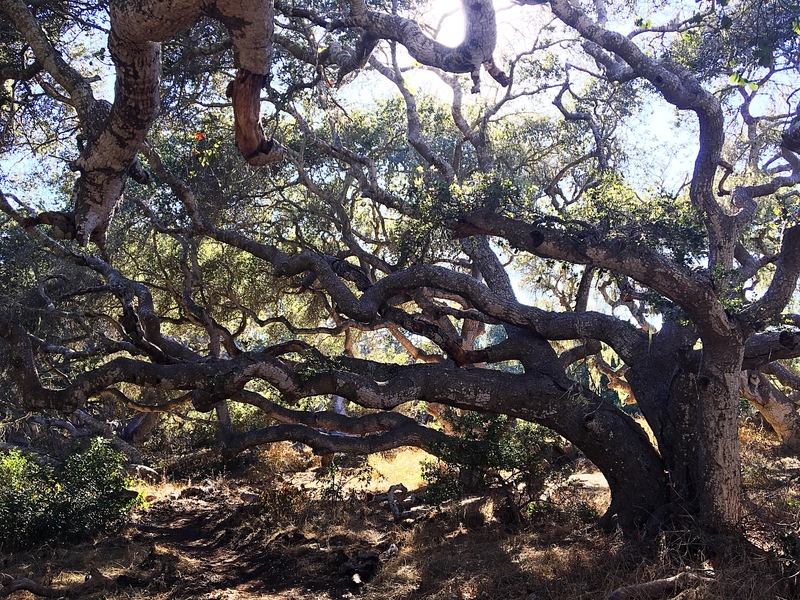 As the day grew warmer, I drove east on Los Osos Valley Road to an 85 acre reserve, which is home to Chumash middens, ancient sand dunes, and three varieties of Oaks up to 800 years old. At the trailhead, I found a map and I planned my route — a loop that would encompass all three sections of the gentle trail. At the first trail marker I became confused. It pointed in three directions (right, left and straight), but it was placed much further than the left-hand trail. I walked to the left, but questioned if I had chosen the trail I wanted. 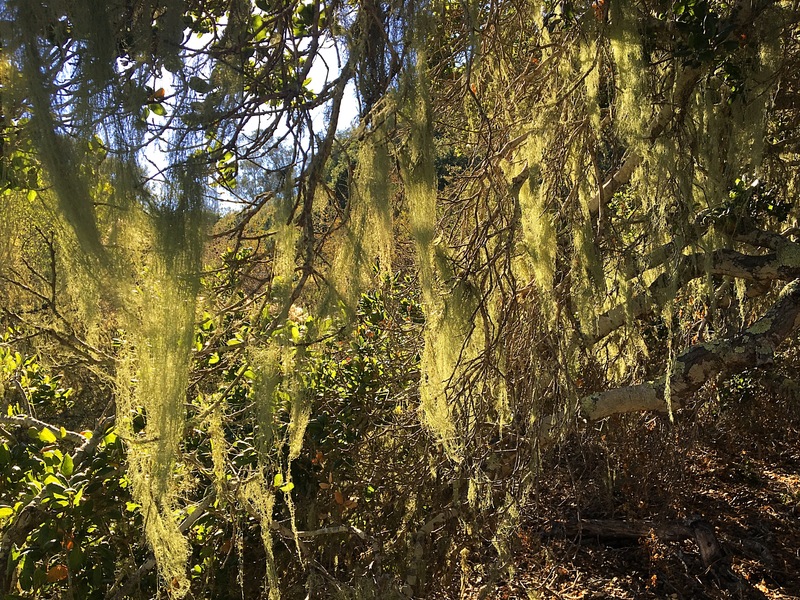 Hesitation faded while I examined Beard lichen drooping from oak branches, but this section of the trail moved directly next to the road and the traffic distracted me from immersing in the forest; the noise was jarring compared to the otherworldly beauty of the oaks. The path began splitting into what I assumed were local trails and deer paths. Which one was the “right” trail? Turning a corner, I saw an enormous oak with wide-spread branches, twisting and turning, defying all patterns and rules. 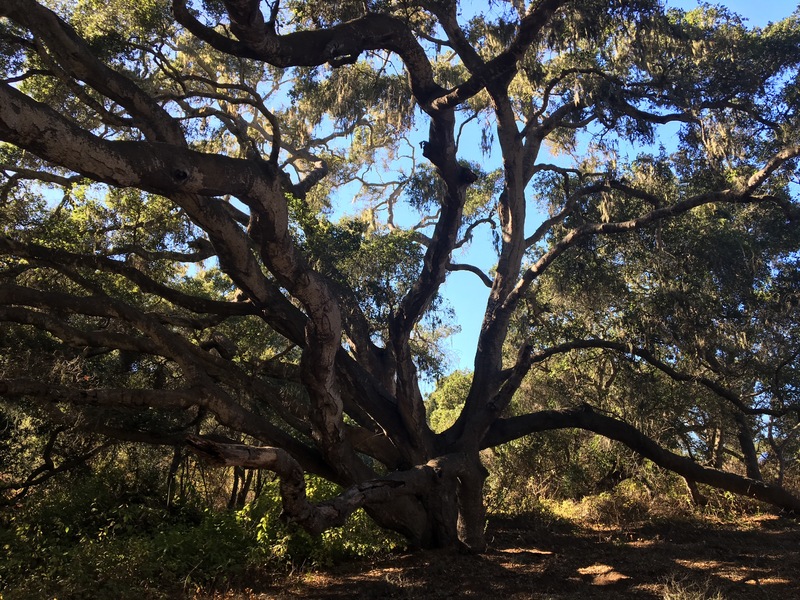 I approached the grand oak in awe of its divine, ancient presence, and when I moved under the furthest reach of her branches, the road suddenly went silent. For just a moment, it was only me and the oak. As trails took me further from the road, noise faded into the peace of nature. Oak branches created natural benches for me to sit on and listen to the crows call and birds sing. Gazing into the forest, it seemed the branches formed a wild tapestry, building intensity by intertwining and crossing each other. If only I could harness the vitality of the oaks in my writing. What could I possibly do to draw that force into my craft? I continued on my way, guessing which path to take each time it splintered. Trails twisted and turned like the oak branches above them; I had to surrender to the randomness and chaos. 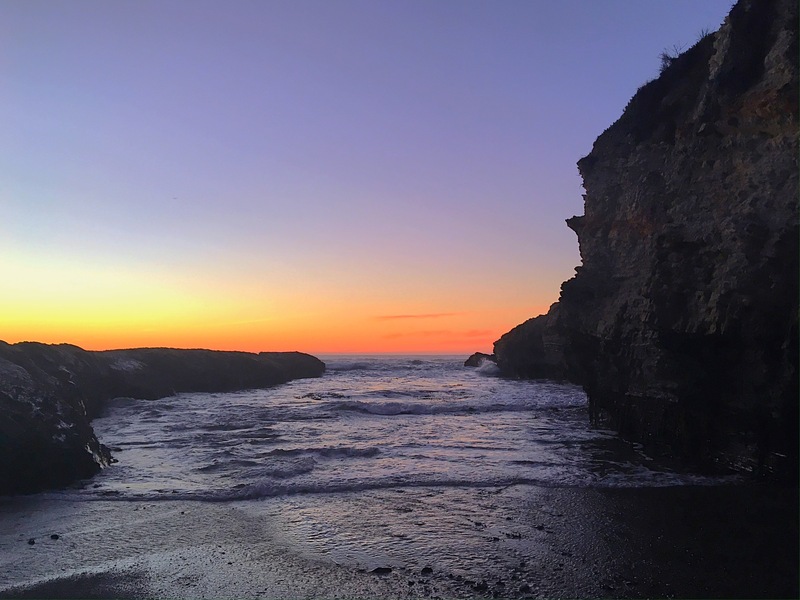 I guessed my direction more than I was certain — I thought I was on a new trail until I came across a landmark and then I thought I was on a familiar trail until I saw something unusual. I felt like Alice in Wonderland, not knowing if I was here or there or lost or found, popping in and out of the forest onto the dunes. Stepping onto the shrub-covered sand dunes, I had an areal view of the oak canopy. Butterflies fluttered before me in graceful arcs. 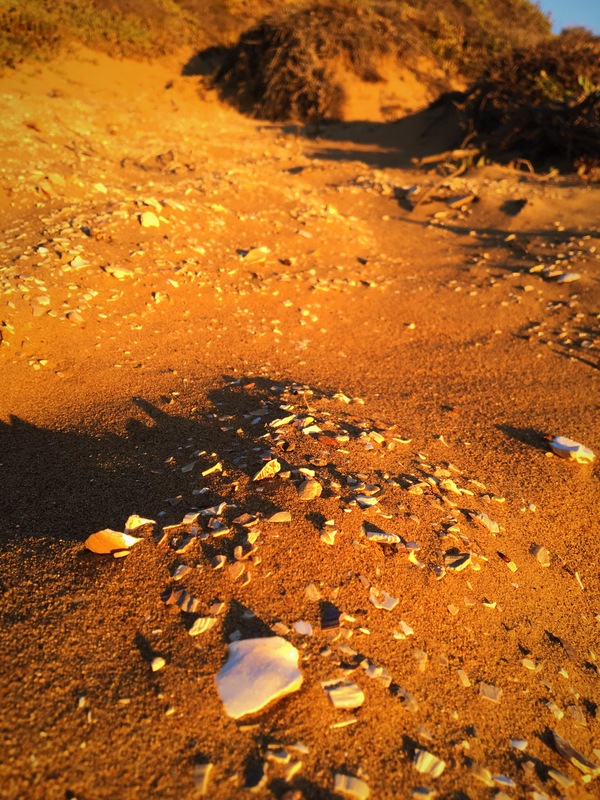 I came across middens, which spoke of the site’s Chumash heritage, the indigenous people who lived in the area for millennia — from Prehistoric times until the 1700s when the Spanish settled. By the end of the hike I felt grateful for the road because the sound gave me a sense of direction. 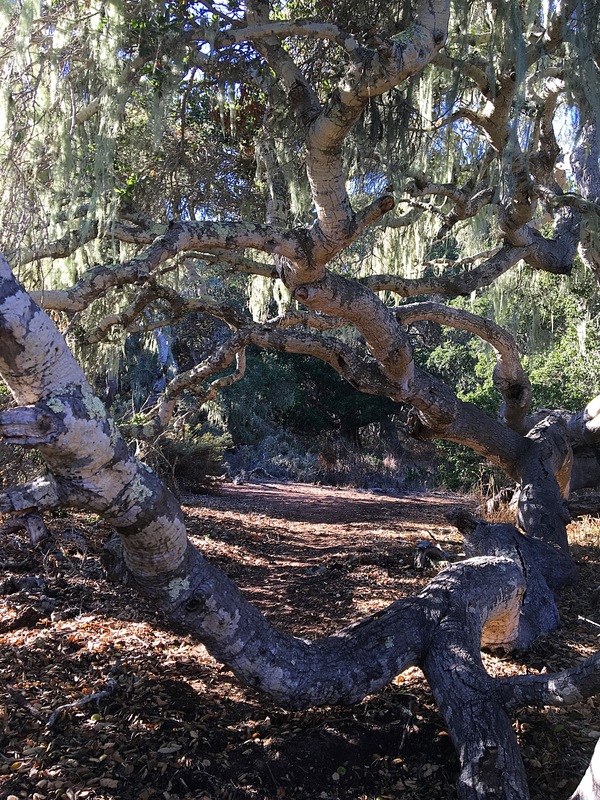 Walking out of the reserve, I felt like the Los Osos vortex had sucked me in and swirled me beneath its oaks in a meandering dance. 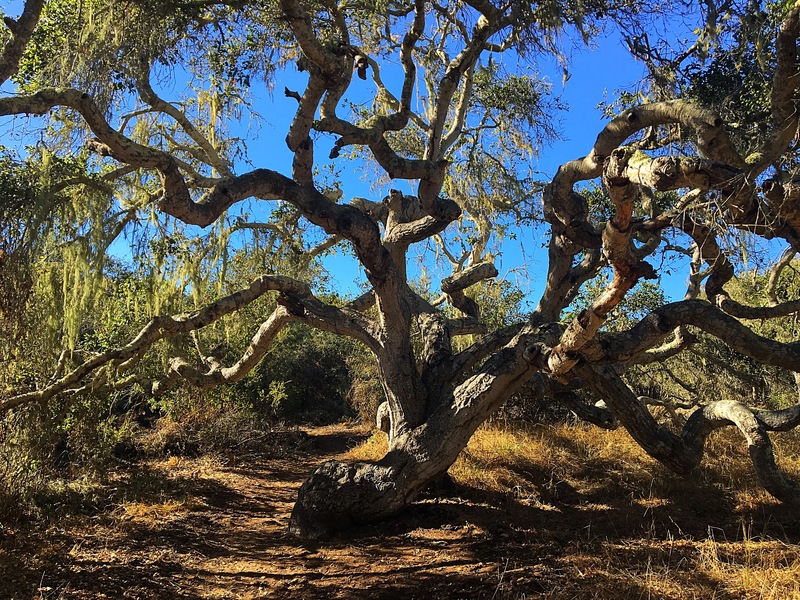 Finishing my strange wanderings in the Oaks Reserve, Nikki and I met again for a walk in the El Moro Elfin Forest Natural Area. 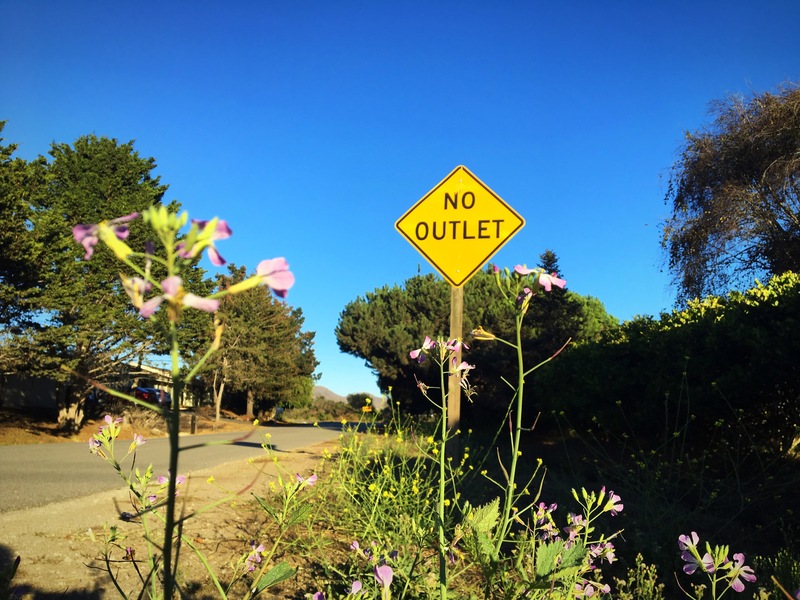 One of the most protected areas of Los Osos, the path is a complete, unified boardwalk and there are strict guidelines to keep visitors off the vegetation. This nature walk is great for strollers and people with disabilities — one entrance even has wheelchair access from the road. 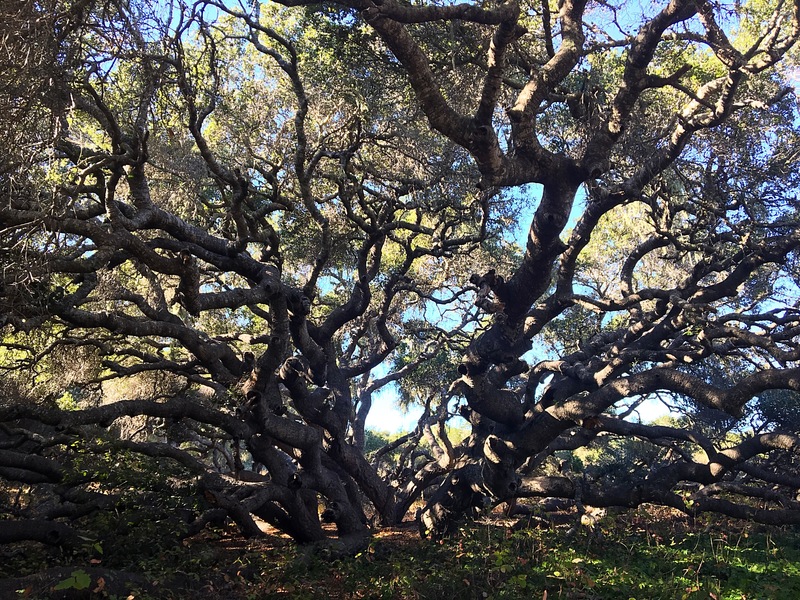 Consisting of 90 acres with views of Morro Rock, the Elfin Forest is aptly named for the pygmy oaks, which are a variety of California Live Oak dwarfed by soft soil, mineral depletion, salt spray and constant wind. 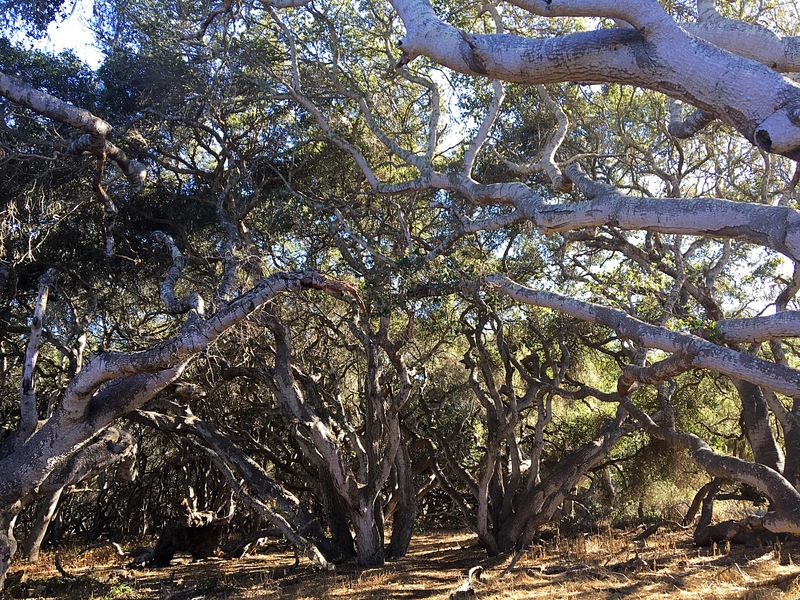 Despite their small stature, these pygmy oaks are 200-400 years old. We came to small clearing. Nikki set her bag down and began twirling her hoop. “Hooping is another way I create ceremony and ritual in my life,” she said as the hoop orbed around her. While Nikki spun her hoop, I invited my mind to empty and become present. We had to complete our walk because Nikki needed to do homework. I, on the other hand, got to finish my day with the crown jewel of Los Osos. 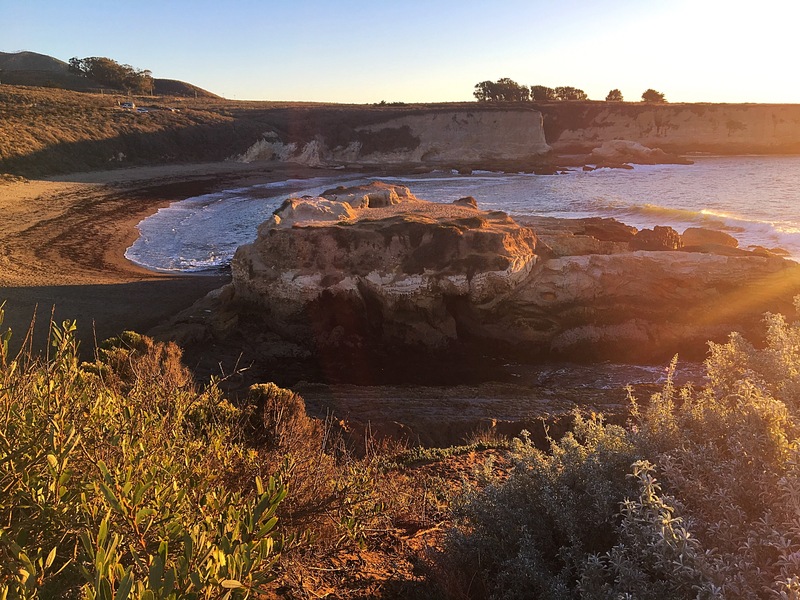 Named after the glory of springtime wildflowers, Montana de Oro (Mountain of Gold) is at the end of the last road in Los Osos and is gorgeous every time of year. Stretching 8,000 acres, most of the land is completely wild. I got out of my car at Spooner’s Cove to eat a picnic dinner with the sunset. Instead of watching it from the beach, I took a quick hike on the north bluff of the cove. As I ate, gulls flew towards Morro Bay and waves crashed on the tide pools and rock formations below me. I thought about my artistic vow and the bouts of resistance I encounter towards it. I want to be more productive, I want to write with more inspiration. So why am I standing in my own way? And what ceremony and ritual could I use to destroy these blocks? I thought back to what Nikki said about getting into the flow with meditation. 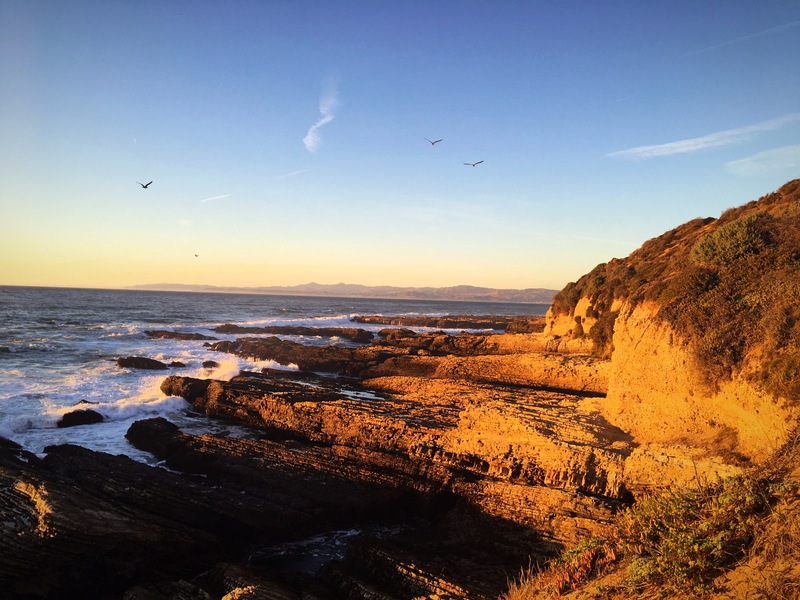 I looked out at the ocean — powerful, deep, vast, mysterious. I timed my breath with her waves and set my focus there, clearing my mind. We moved together and suddenly I knew. I touched the turquoise necklace I was wearing and had bought because turquoise is a symbol of clear mindedness, creativity, communication, and releasing blocks around self-expression. When the sun dipped behind the fog bank at the horizon, I walked back to Spooner’s Cove. I approached the ocean with my hands on my heart. Everyone was leaving the beach since the sun had set, but I walked to the water with sincere reverence and intention. Pebbles crunched beneath my feet. I walked to the water and she approached me as well, reflecting the colors of the sunset. Wispy clouds turned pink in the distance, but the sky above me was clear. Little bugs with large wings flew through the air like tiny angels. I walked to the far right of the beach, which was entirely secluded. To the right, seaweed grew down the cliff and to the left, rock formations created a wall. 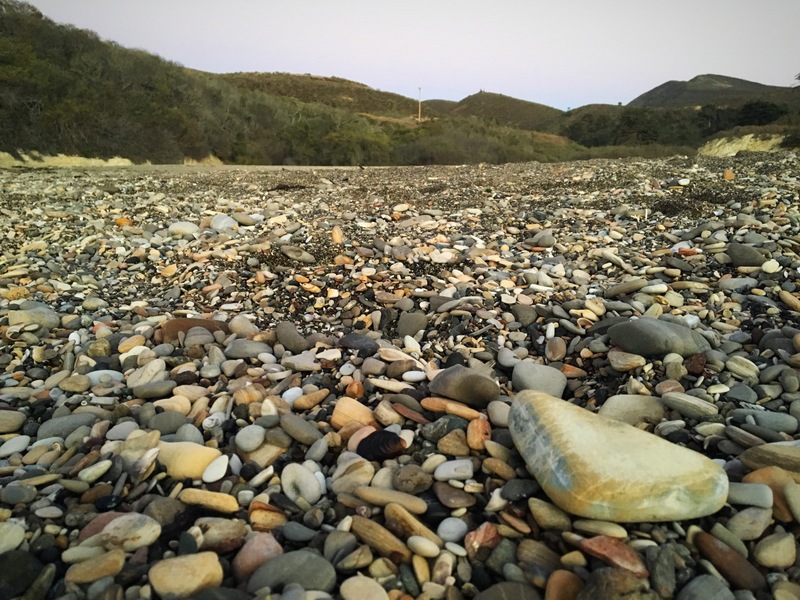 Behind me, Islay Creek came from the depths of the Montana de Oro wilderness to meet the ocean. It was the perfect place for my ceremony. “Dear Ocean — powerful and deep, beautiful, mysterious, a force unlike any other — people come from every corner of the earth to see You, to know You. You’re ever present, ever moving; You’re expansive, You stretch further than I could ever see; You inspire; You bring us peace; Your power creates awe in the most cynical and hardened hearts. You, Ocean, were my constant companion when I was a child, I grew up playing in Your waves; You are my home; now, even though I don’t live near Your shores, You still feel like home, close to my heart. I took off my necklace and bowed to the water. I dipped the stone in her waves as they approached and put my hand in, too. I placed my hand on my throat and felt my pulse as the water dripped down to my chest and belly. I changed hands, prayed again, dipped the stone, touched my hand to the water and again to my throat. I clasped the pendant and felt it throb with power and vitality. The little bugs flew around me and gulls passed silently in the distance. I put my necklace back on and bowed to the ocean, waiting for her to come to me. She returned, so sweetly. With my hands in prayer, I placed them both in the water and put them back on my throat feeling the wave drip down my arms and chest. “Amen,” I said, moving my hands to my heart. The sky had turned to violet. I struggled to pull myself away from the ocean even though night descended upon us.